If you’re going to declare war on Amanda Waller, you’d better make sure you win. That’s what Maxwell Lord discovered in the final issue of Rebirth’s first big event, JUSTICE LEAGUE VS. SUICIDE SQUAD #6. Granted, one could argue that Lord is in a better place at the end of the issue than he was at the beginning. At the end of the issue #5, Maxwell Lord had been possessed by the sinister Eclipso, who quickly darkened the sun and spread evil throughout Washington D.C., corrupting both the Justice League (with the exception of Batman) and much of the Suicide Squad. 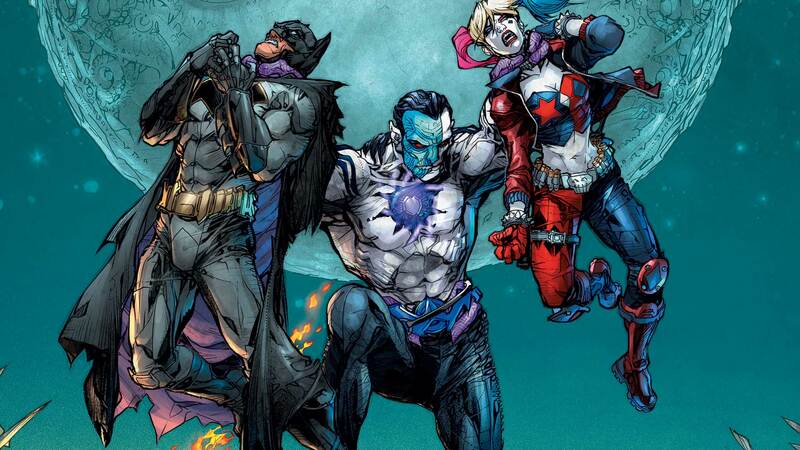 With the likes of Superman, Wonder Woman and the Green Lanterns now playing for the wrong team, it comes down to the very unlikely partnership of Batman, Lobo and Killer Frost to do what they can to stop Eclipso…preferably without injuring their corrupted friends in the process. Noting that Eclipso’s weakness is sunlight and that Superman’s powers are charged by the sun, Batman asks Killer Frost to use her powers to construct a prism that would convert Superman’s heat vision into sunlight. With the help of the Justice League and more of Superman’s heat vision, Killer Frost’s prism makes things bright as day, blasting away Eclipso and leaving the battered, but still breathing, body of Maxwell Lord on the lawn. But when Amanda Waller tells Killer Frost to absorb his life force, which would keep the now fully diminished Caitlin alive, but kill Maxwell Lord, Caitlin refuses, saying instead that she quits the Suicide Squad. Her noble actions, both in creating the prism and refusing to kill Maxwell Lord, gain the notice of Batman, Superman and the rest of the Justice League, who realize Caitlin isn’t the villain that her reputation might suggest and insist that Waller release her. Waller, surprisingly, agrees. But perhaps it’s because she has a new prisoner to keep her busy. He assumes he’s to be enlisted in the Suicide Squad. But he’s wrong. Task Force XI? As in the number eleven? Has the X in Task Force X been referring to the number ten all of this time? And what exactly is Task Force XI? Your guess is as good as ours. One thing’s for certain, we can’t wait to learn more. But when? !